Although Zieria prostrata is native to Australia, in its native habitat it regarded as a threatened species. Originally from coastal New South Wales mainly near Coffs Harbour, Zieria prostrata is sometimes called ‘Headland Ziera’ however is available for sale under a number of names. Glossy foliage, dense carpeting habit and masses of small pink flowers from winter through spring make this an excellent choice as a ground cover plant. One of the most widely grown, and readily available cultivars is the low growing form Zieria prostrata ‘Carpet Star’. This is an evergreen low growing carpeting plant that requires little to no maintenance and is popular in mass planting with commercial landscapers. 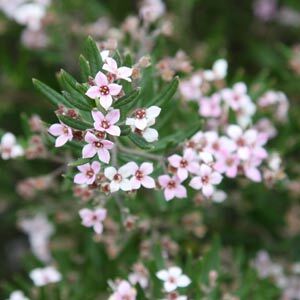 Flowering in spring to summer with starry white to pale pink flowers the plant will also attract bees and beneficial insects. Once established it is regarded as drought tolerant and requires no pruning. It is best when grown in a position where it is protected from frost when first planted. A low phosphorus native plant fertilizer can be applied once a year although this is not essential. One lone Ziera species is from New Caledonia. Drought tolerance is reasonable once established – will require water in very dry summers. Low maintenance and suited to commercial landscaping.